Pic of the day: Summer landscape. 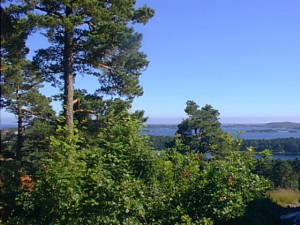 In the background the south coast of Norway, as seen from the land side. I did not stay indoors and dream all day, but also took a walk in the sunshine! I was reading my favorite Newspaper, the Norwegian business paper Dagens Næringsliv. (Not that you will find the thing I write about there, but if you read a Scandinavian language, you may get an idea of what kind of newspaper I like.) Anyway, there was this big 2-page ad, the biggest possible, for some vaguely new-economy company whose name is unimportant. There was one thing that drew my attention, though. The company's URL was there, and it was mine. Their e-mail address was also mine. I didn't know them from Acme Inc, so imagine my bafflement. My first impulse was that Amber must have bought the ad to pull my leg. Then suddenly I remembered something I had read a couple days ago in Illustrert Vitenskap, the Norwegian popular science magazine. There was an article about dreams and dreaming, and a box about lucid dreaming. That is, dreaming while aware that you are dreaming, retaining your awake personality. The box had recommended that if one wanted to dream lucid dreams, one should write down one's dreams each morning. And then one should have a text written on a piece of paper, and habitually pull it out and look at it through the day. When the text had changed, you knew it was a dream and could act accordingly. :) So, I looked at the paper and realized that I was dreaming the whole thing. Now, unlike some of you, I don't particularly want lucid dreaming. In fact, I appreciate being free of the responsibility that follows with being me. If anything, I try to escape during daytime too: By hiding in computer games, comic books, and fantasy literature. Dreams are even better. In dreams, I often live completely different lives. With a different life, a different body, a different family, different friends, and different laws of nature. I like it. I'm so free that I forget myself. Being aware in the dream would at best reduce it to some kind of virtual reality. I have been on the verge of doing that before, and managed to avoid it. I did so today again. As I understood what was going on, I willed myself awake. That did not keep me from retaining a faint awareness during the next dream, which was long and consisted of working for a big company with a very different corporate culture. There were lots of hi tech stuff and the dream was all right, I guess. But I had this nagging feeling that it was just a dream. It detracts a bit from the experience. In some of the strange dreams, I have magic power. As a rule, if there is magic in that world, I have it too. And funny thing is, these various souls seem to share a common box of magic tricks. For instance, telekinesis and levitation. If I cannot move things - including me - with the will, I feel surprise. That is typically also a sign that the dream is near its end, though I am not aware of that inside the dream. Flying is something lots of people dream about, and almost all dream that they fly low, just above the ground. Same here, really. Telekinesis was something that showed up during my teens, and has stayed. Others come and go, like the ability to turn invisible or intangible, or change the shape of things. Teleportation is something I added as an adult. At first it was a purely magic thing: I reached out to the Power and stretched my spirit in the direction I wanted to go. It always felt like a dare, like a risk. I had to give up my footing where I was before I could breakt through to where I was going. Later, a fellow I met online (Drew Gillmore) told me about his own teleportation, which he had used when he was an alien. (See, I am not the only weird human.) I use a modified form of that now, and it saves a lot of energy. My new teleportation is based on seeing reality as a pattern. Actually, seeing reality as a pattern is conductive to lots of strange effects, but this is perhaps the most practical. I'll try to explain it the way one of my fictional characters explains it. In Robert Jordan's "Wheel of Time" epic fantasy series (will it ever reach a conclusion?) there is something called Tel'Aran'Rhiod (T'A'R among connoisseurs) or the World of Dreams. It is a reflection of the real world, only there are also lots of other real worlds (the worlds of if) which may also to some degree be reflected in it. So it is not too stable. Things there may flit in and out of existence, or change at short notice. A few people are at home there, able to go in and out of T'A'R at will, and able to change things there with their mind. At the very least things about themselves, such as clothes, but sometimes other things as well. Dreamwalking is risky business: Unlike normal dreams, T'A'R can be fatal. If you die there, your body will never wake again. And to add to the risk, nightmares can become real. If you enter the place with fear, your fears may take shape and attack you. Not for kids! Luckily it is all fiction. Even in real life, dreams are not completely without risks. Most of those who die in their sleep, do so in the morning, when REM sleep is dominant. This form of sleep exercises both the mind and parts of the body, including heart and lungs (and reproductive organs, incidentally). Like any kind of exercise, there is some risk if you are already on the verge of a heart attack. Sorry about that. On the other hand, if we did not have this mechanism, we would not just die while awake ... we would also die earlier, at least the majority of us who get a little less exercise than recommended. Like you have come to expect from nature, even dreams have a purpose. Health peeve of the day: Upper jaw on right side.